Belle is from Mort's last litter of 4 pups sired by DC Layfayette's Border Baron UDX2 MH. Baron is a wonderful representation of the breed excelling at all levels of competition to learn more about Baron click here. One of Belle's grandfathers is the famous DC/AFC Masked Shoshoni War Chief and she is a double great grand-daughter of NAC/DC/AFC Renegade's Kansas Kid. She is a very heavy Bazooka line cross. Belle is very smart and beautiful like her mother and very bold. She goes completely insane on birds. Belle had a great trip last fall to North Dakota and Iowa, pointing many wild pheasants. Belle is a Master Hunter, trained and campaigned by Chad Hines of Willow Creek Kennels. Belle also has multiple juveinelle field trial placements as well as 2 adult points in Amatuer stakes. 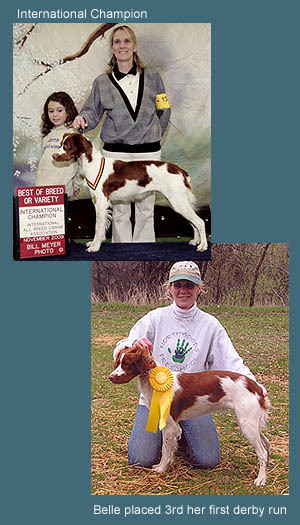 Belle is an International Show Champion and as well as a Juniors dog in Junior Showmanship. She will continue to help the kids in the ring. -Dr Jac's Must Have Been the Roses "Taters"